February brought not numerous but interesting updates. You can first read the State of Streaming Protocols for February 2016. Mobile Broadcasting SDK was updated along with Larix Broadcaster sample application. Larix Broadcaster for Android and Android SDK now has several improvements, bugfixes and provide more control over camera object. This allowed demonstrating "torch mode" as example. Larix Broadcaster for iOS was updated with improvements and bugfixes as well, the SDK was updated accordingly. HEVC live streaming support was improved, now it supports RTSP and MPEG-TS as input, with MPEG-DASH, RTSP and MPEG-TS as output. You can read more details in this article. Also please check our digest HEVC feature set page for the list of all H.265 features. To improve Nimble Streamer deployment options, WMSPanel now allows adding pre-configured Nimble Streamer via UI. This is a good addition to existing Repair configs after HW failures and Deployment automation capabilities. A couple of config parameters were added per customers' requests. This includes mpegts_for_audio_vod option for HLS streaming to limited-capability devices and also vod_to_ram_cache_first to use RAM cache for VOD streaming before disk cache. Please find more details in Nimble configuration description. Nimble control API was improved with a new of methods Get streams list. It's for getting the list of streams for a given server. Along with Get real-time data for multiple streams it allows obtaining info about current streaming status. We'll continue improving our API. The metrics calculations are based on nearly 1.7 billion views. The stats are collected from 2500+ media servers (Nimble Streamer and Wowza). Protocols share remain stable, i.e. HLS share is about 70% and MPEG-DASH is still competing with SmoothStreaming. 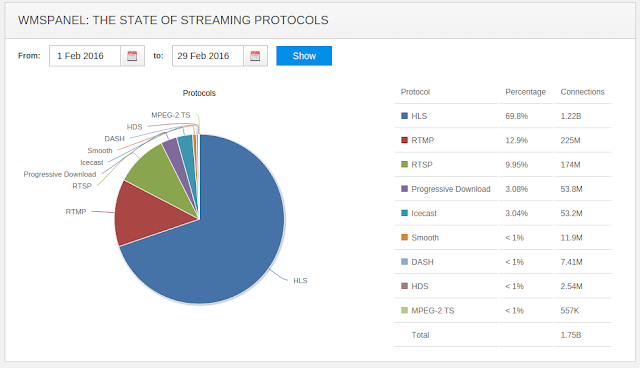 The State of Streaming Protocols February, 2016. You can compare that to January stats below. Nimble Streamer can be deployed and manipulated in various ways for various platforms. First of all you can install it from scratch on Linux, Windows or Mac on x64 or ARM. In addition you can bring it up from an image in Azure cloud. Being installed, Nimble can be controlled via WMSPanel. It provides convenience of control and reporting. Multiple server instances may be controlled via single web UI. You can also run Nimble without registering WMSPanel, in this case you need to fix rules.conf file (e.g. /etc/nimble/rules.conf under Linux) to set streaming scenarios. This is especially useful when you automate your deployment. However, our customers prefer registering their Nimble instances to WMSPanel even after manual setup. The problem is their settings will be replaced with default settings upon registration as it would be a new server in terms of the panel. Previously we introduced the way to apply existing server settings via command line. Nimble takes rules.conf and applies the lines that are valid. If some entries are not valid, they will be automatically ignored. Now we also introduce the web UI for rules.conf import and analysis. It allows specifying the config via dialog and see what is right or wrong about. Go to "Servers" menu to open servers list and scroll down to the bottom. Nimble Streamer has a huge feature set for live streaming. Nowadays live streaming uses H.264/AVC as a default codec. As media streaming technologies evolve over time, a new H.265/HEVC codec was introduced a few years ago. This is a more efficient codec, especially for 4K and upcoming 8K streaming as they require huge bandwidth consumption hence the need for a codec with better compression. So our team continued improving HEVC feature set and now we introduce live transmuxing for HEVC. The input for HEVC live streams are RTSP and MPEG-TS via both UDP and HTTP. These are the formats that may deliver HEVC today. As an output Nimble Streamer provides MPEG-DASH, RTSP and MPEG-TS (UDP and HTTP). The MPEG-TS output is unique among all software transmuxing solution presented on the market. Nimble can also wrap HEVC into HLS streams that can be played in certain players. Read Nimble Streamer HEVC digest page to see full set of HEVC-related features. This HEVC transmuxing functionality is available on all hardware platforms supported by Nimble Streamer which includes x64 and ARM and all supported OSes like Linux, Windows, MacOS and Raspberry. Feel free to install Nimble Streamer and try this feature set in action. Let us know if you have any questions or suggestions on it. The setup of each scenario is performed the same way as it is done for H.264-powered streams, it's transparent for WMSPanel and Nimble Streamer. We expect HEVC streaming to grow this year so Nimble Streamer capabilities will definitely help the industry to adapt this codec.